Team Illuminate seeks to bring light driven sculptures to downtown San Jose. Members include Ian Lee, Ryanne Zertuche, Natasha Mislang, Matthew Montero and Alberto Reyes (photo by Assistant Professor Craig Hobbs). SAN JOSE, CA — Sixteen teams of creative and imaginative San José State University students will showcase their technological solutions for many of their city’s most pressing issues – including downtown safety, traffic congestion, the homeless, and support of local small business entrepreneurs – on Saturday, April 8, at the Paseo Public Prototyping Festival in downtown San Jose. The Paseo Festival Expo will be open 10 a.m. to 5 p.m. on the Hammer Theatre Plaza, 101 Paseo De San Antonio. In the evening, teams will present their final pitches from 6:30 to 8 p.m. on the Hammer Theatre Center main stage. Along with the student team competition, the festival will feature other exhibitions and speakers focused on art and technology, science and engineering, as well as civic engagement. In preparation for the festival, students majoring in art, design, engineering, business and the sciences have spent the past year in collaboration with fellow team members to develop and refine their proposed solutions for improving life for the people of the city of San José. The student teams, selected by a competitive review process headed by university faculty members, as well as industry professionals, will demonstrate their prototype devices and apps and be available to answer questions throughout the daylong festival. An app that helps individuals with niche interests and hobbies find other like-minded persons as well as events and organizations related to those pursuits. One of the teams – Traxis Design – created the modified skateboard that features an axle team members call “a truck” that allows the moving board to generate electricity while it is used during daylight hours. The collected electricity can then be used later for multiple purposes. “We ride a skateboard to get around, so one of our team members thought it would be really convenient to add features to create and generate a source of electricity that can be used later,” said Josh Siqueido, a senior finance major from Oxnard. His collaborators on the Traxis Design team are Connie Jiang, a graduate student in human factors and ergonomics from San Francisco; Aaron Caprino, a sophomore mechanical engineering major from San Jose; John Chaloeicheep, a junior aerospace engineering major from San Jose; and Omar Riaz, a freshman software engineering student from San Jose. Siqueido indicated that he and his Traxis Design team plan to stay together to market their creation and work to develop other innovative products in the future. A similar goal was expressed by members of other participating festival teams. 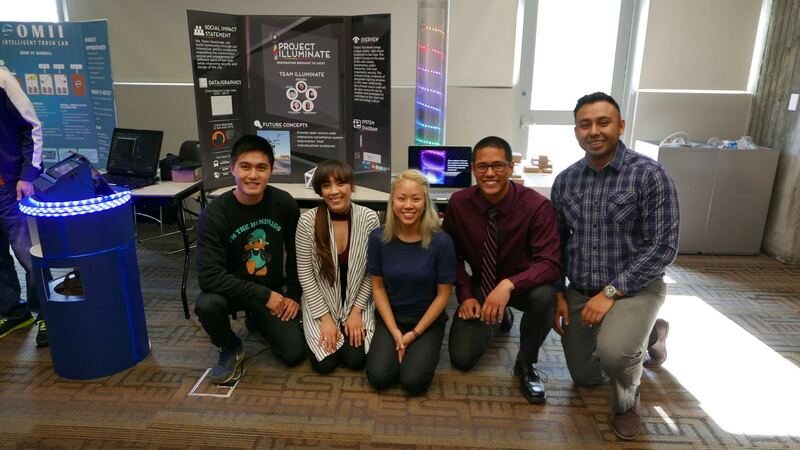 In September of last year, San José State University – in collaboration with the John S. and James L. Knight Foundation, the City of San José, Intel, Microsoft and Autodesk – launched the Paseo Public Prototyping Challenge and Festival. A panel will announce the top three innovative creations from among the 16 teams, with first place winning $5,000; second place earning $3,000; and third place awarded $2,000.